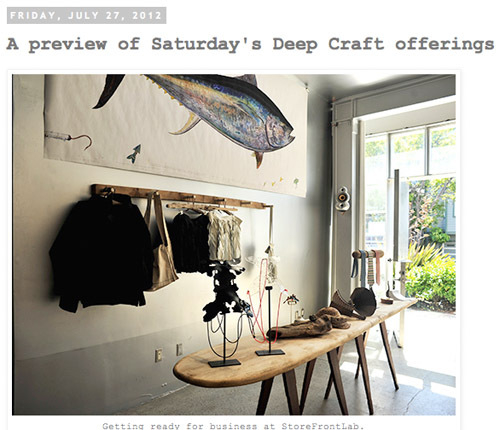 Click here to learn more about Deep Craft Atelier, a pop-up store at Storefront Lab. 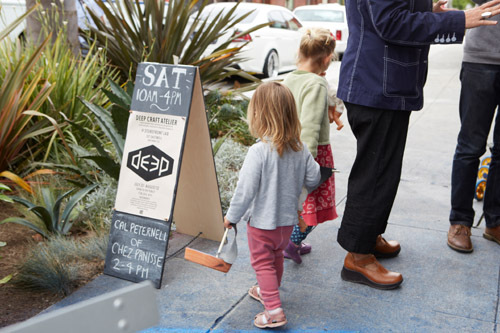 We spent another lively Saturday hosting Deep Craft Atelier for the second of three weeks at Storefront Lab in San Francisco’s Mission District. Guest Chef Cal Peternell of Chez Panisse grilled delicious chapati flatbreads served up with fresh veggie chutney and yogurt. Gabriel Russo spent the day sewing Deep Jerseys in the space and even measured a few people for custom orders. We were especially blessed to have photographer Hans Kiotek documenting the day, whose splendid images appear throughout this post. Please join us this Saturday for our final Public Saturday, 10-4 pm, with food by Leif Hedendal 2-4 pm. 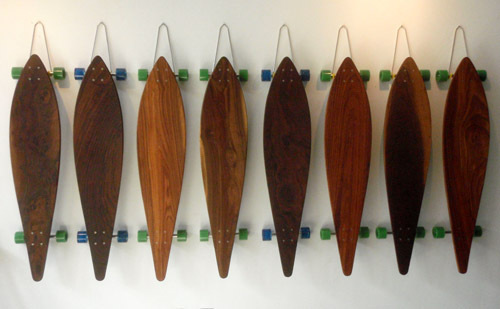 Deep Deck longboards in claro walnut, black acacia and American elm. 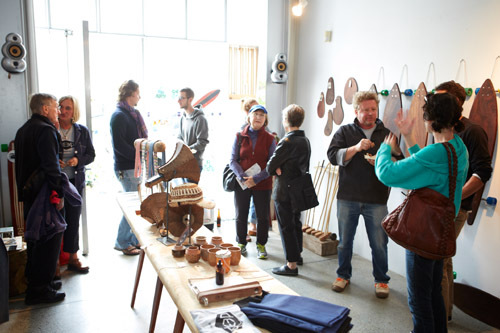 Our Deep Craft Atelier pop-up store project opened last week at Storefront Lab, with the first public sale on Saturday. We spent a convivial day fielding questions, selling goods and entertaining the curious, many of whom peeked in while we were setting up shop over the course of the week. Yvonne Mouser of Thought for Food vends a refreshing variety of ‘surf pops’. Click here to see more images of Deep Craft Atelier at Storefront Lab. I’m so excited to open Deep Craft Atelier to the public tomorrow, Saturday, 10-4PM at Storefront Lab, 337 Shotwell in San Francisco’s Mission District. It’s been a fun and challenging week making product on site and getting the space ready so I have not had time to post any updates. 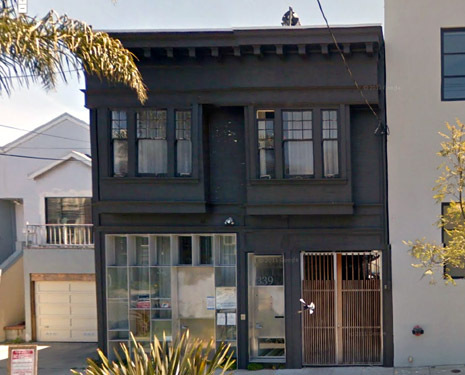 Fortunately, my friend Yosh Asato of Storefront Lab has been tracking our progress, so please refer to her recent post here for the latest images. I hope to post a detailed synopsis of the project over the the duration of the project over the next two weeks. Please stay tuned and stop by if you’re in the neighborhood. 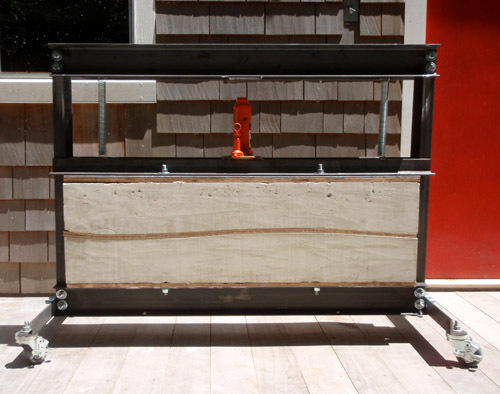 I designed a portable, adjustable-length hole-drilling jig for mounting trucks to decks. I’ve been having fun making my first production run of Deep Deck longboards in Jupiter, my hydraulic press, whose crushing force shapes camber and concavities in veneers of elm, black walnut and acacia. I love when production runs give me a chance to invent specific jigs and fixtures, and I’m getting ready to try out my new truck hole-drilling jig in anticipation of my Deep Craft Atelier project at Storefront Lab. The jig is the latest development in my line of portable tools to make skateboard decks at remote sites in anticipation of a series of pop-up stores in the SF Bay Area and along the West Coast. Consisting of two identical blocks of 3/4″ thick aluminum, threaded along standard 3/8″ diameter all-thread, the jig allows for an adjustable wheelbase, and serves as a template for drilling mounting holes for standard trucks using a hand drill. Click here to read more about the development of the Deep Deck longboard. 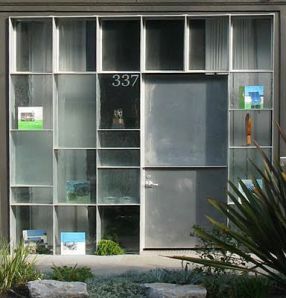 I’m honored my Deep Craft Atelier has been selected to be the lead-off project for Storefront Lab, David Baker and Yosh Asato’s experiment in community engagement, public space and commerce in San Francisco’s Mission District. Beginning July 23rd, I will convert the space to a workshop and weekly retail venue featuring my Deep Deck longboard and other Deep Craft goods now under development. I’ve invited a group of friends to design and make other small products that complement the scope and scale of a pop-up, conceptual ‘board shop’ that will be open to the public on three consecutive Saturdays between July 23 and August 12. My friends and I will make things collaboratively during weekday working hours, ranging from skate/surf/bike-related goods to clothing, housewares, jewelry and graphics. I’ve invited guest chefs to prepare food for public Saturdays, when we will offer our limited production wares for sale to the public. I’ve also invited several of my artist friends dispersed around the country to produce 2d works that loosely interpret the idea of ‘seascape’ to hang on the walls. I also plan to host a series of human-powered excursions exploring the Mission and its surroundings on three consecutive Sundays. I’d like to have one on foot, one on skateboards and one on bicycle. If you are interested in leading such an excursion or know someone who may, please leave me a comment or drop me a line at scott@deepcraft.org. Meanwhile, stay tuned as the project shapes up! ‘Jupiter’, my recently completed hydraulic press, forms two Deep Deck blanks at a time. I first started calling my new hydraulic press ‘Jupiter’ when I was forming up the concrete blocks, knowing its compressive force would exceed that of the planet Jupiter, whose gravitational pull is about three times that of Earth’s. 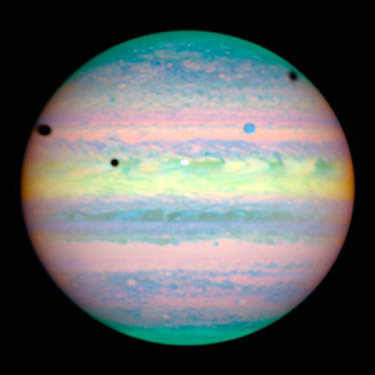 The planet Jupiter is named after the ruling god in Roman cosmology, the god of sky and thunder. As the press took shape I realized it evoked the ancient stone alters dedicated to Jupiter, so the name stuck. I can now press two Deep Deck longboard blanks at a time, doubling my production capabilities and eliminating a complex clamping procedure. ‘Jupiter’ will be central to my Deep Craft Atelier, to premier at Storefront Lab in San Francisco’s Mission District this summer. My longboards will now sport the distinctive stamp, ‘Made in Jupiter’. The planet Jupiter has roughly three times the gravitational force of Earth.